EDMONTON, Alberta, Jan. 11, 2019 (GLOBE NEWSWIRE) -- Athabasca Minerals Inc. (“AMI” or the “Corporation”) (TSX Venture: ABM) announces initial test results for the Montney In-Basin frac sand project (“MIB Project”). STIM-LAB Inc. and Loring Laboratories Ltd. completed testing on a 70/170 fraction size domestic sand, which had sphericity of 0.7, roundness of 0.6, acid solubility of 2.3%, Silicon Dioxide (SiO2) content of 98.5%, and a crush value of 8K. These preliminary results indicate that the MIB Project sand aligns with API Standard 19C, which provides the specifications for sands used in hydraulic fracturing. 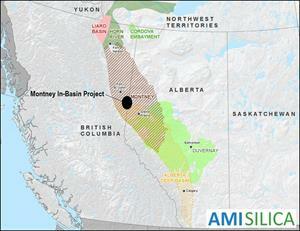 The Montney basin represents over 50% of the entire frac sand demand in Canada. Robert Beekhuizen, CEO of Athabasca Minerals, and President of AMI Silica Inc stated, “AMI continues to make progress toward its strategic goal of becoming the leading in-basin supplier of premium domestic frac sand for the Canadian energy market. With the growing trend in the United States of in-basin frac sand displacing Wisconsin sand, we believe an equivalent trend is on the fore-front in Canada. In due course, a shift in our current dependence on 70% American frac sand supplying Canadian operations is possible. AMI aims to be the pace-setter in Western Canada in providing in-basin premium domestic frac sand with efficient logistical delivery solutions that bring both value and reliability to the development and production programs of energy companies, specifically operating in the Montney and Duvernay regions. Upcoming resource delineation for the MIB Project will include an initial 6-hole confirmation drilling program, followed by a 20-hole drilling program. Drilling will focus on previously identified highly prospective zones, and on lands with logistical advantages. A National Instrument 43-101 resource estimate is planned for completion in Q2-2019 to be followed by a Preliminary Economic Assessment (“PEA”) in Q3-2019. Al Turner, MSc. P.Geol. of Stantec Inc., in accordance with National Instrument 43-101, is the Qualified Person responsible for the technical content of this release and has reviewed and approved it accordingly. Mr. Turner is an independent consultant contracted by the Corporation. The Corporation also announces the granting of 275,000 stock options (“Options”) with an exercise price of $0.28 to officers and employees. The Options will have a five-year term and are subject to a vesting schedule in accordance with the Corporation’s Stock Option Plan. This option grant is subject to TSX Venture Exchange approval. The Corporation is an integrated aggregates company involved in resource development, aggregates marketing and midstream supply-logistics solutions. Business activities include aggregate production, pit management services, sales from corporate-owned and third-party pits, acquisitions of sand and gravel operations, and new venture development. Athabasca Minerals is also the parent company of Aggregates Marketing Inc. – a midstream business providing integrated supply and transportation solutions for industrial and construction markets; AMI Silica Inc – an in-basin supplier of premium domestic frac sand for Alberta and NE British Columbia; and joint venture owner of the Montney In-Basin Frac Sand Project. The Corporation also has industrial mineral land exploration licenses that are strategically positioned for future development in industrial regions of high potential demand. This news release contains certain forward-looking statements and forward-looking information (collectively referred to in this news release as “forward-looking information”) within the meaning of applicable Canadian securities laws. All statements other than statements of present or historical fact is forward-looking information. In particular, but without limiting the foregoing, this news release contains forward-looking information pertaining to the following: Athabasca Minerals Inc. (“AMI”), Demand and Supply of Frac Sand & Projections, AMI Silica Inc. and the Montney Frac Sand Project. In addition to the assumptions contained within the body of this news release, the forward-looking information in this news release is based on certain key expectations and assumptions of AMI including: growth for frac-sand markets, ability to successfully integrate initiatives with material contracts, and no material adverse changes to the business of AMI. Although management of AMI consider these assumptions to be reasonable based on information currently available to them, these assumptions may prove to be incorrect. Forward looking information is subject to known and unknown risks, uncertainties and other factors that may cause the actual results, level of activity, performance or achievements of AMI to be materially different from those expressed or implied by such forward-looking information. Such risks and other factors may include, but are not limited to: general business, economic, competitive, political and social uncertainties; general capital market conditions and market prices for securities; commodity pricing risk including pricing for silica sand and other aggregates; resources may not have the quality of quantity that management anticipates; changes in reclamation obligations estimates; delay or failure to receive board or regulatory approvals; the actual results of future development or operations; competition; changes in project parameters as plans continue to be refined; accidents and other risks inherent in the aggregates and construction industries; lack of insurance; changes in legislation, including environmental legislation, affecting AMI; the timing and availability of external financing on acceptable terms; and the lack of qualified, skilled labour or loss of key individuals. A description of additional assumptions used to develop such forward-looking information and a description of additional risk factors that may cause actual results to differ materially from forward-looking information can be found in AMI’s disclosure documents on the SEDAR website at www.sedar.com. Although AMI has attempted to identify important factors that could cause actual results to differ materially from those contained in forward-looking information, there may be other factors that cause results not to be as anticipated, estimated or intended. Readers are cautioned that the foregoing list of factors is not exhaustive. As such, readers are further cautioned not to place undue reliance on forward-looking information as there can be no assurance that the plans, intentions or expectations upon which they are placed will occur. Forward-looking information contained in this news release is expressly qualified by this cautionary statement. The forward-looking information contained in this news release represents the expectations of AMI as of the date of this news release and, accordingly, is subject to change after such date. However, AMI expressly disclaims any intention of obligation to update or revise any forward-looking information, whether as a result of new information, future events or otherwise, except as expressly required by applicable securities law.